This Thai Coconut Curry Basil Shrimp Recipe is fresh, light, flavorful and satisfying, and makes a great Weight Watchers summer dinner recipe. The sweet, peppery basil complements the spicy curry perfectly, and the polenta makes a wonderful vehicle for all these fabulous flavors. This traditional Thai shrimp recipe is usually served over rice, but I like the lighter taste of the polenta. Each very nicely sized serving is just 6 Points, and is packed with delicious flavor. Pair it with some fresh cucumber salad, and you’ve got yourself a wonderful, healthier alternative to Thai takeout that is much more Weight Watchers friendly. 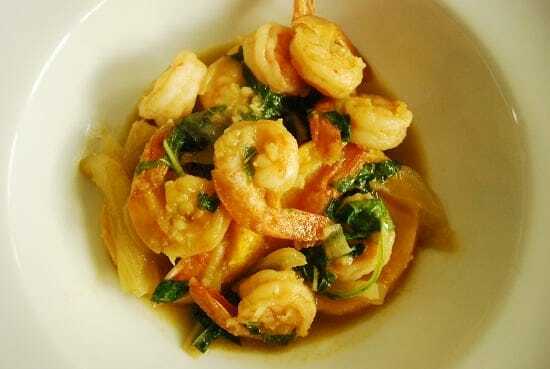 Deliciously flavorful, this Thai Coconut Curry Basil Shrimp is very filling at just 6 Points for each laege serving. A great Weight Watchers shrimp recipe that’s easy to prepare for quick weeknight dinner. Preheat oven to 400 degrees. Slice polenta log into 12 evenly sized slices (about ¼” thick). Line a baking sheet with aluminum foil and spray generously with non-fat cooking spray. Lay polenta slices on baking sheet and bake for about 25 minutes, or until polenta begins to brown and crisp. Spray a large wok or skillet with nonstick cooking spray and set over medium high heat. Add in garlic and onions and sauté until they begin to soften, about 2-3 min. Stir in broth and curry paste, and then add in the shrimp and sauté for about 2 minutes. Pour in coconut milk, lime juice, and fish sauce and simmer until shrimp turns pink and is cooked through. Remove from heat, and stir in basil. Add 2 polenta slices to each serving bowl and top with shrimp and sauce, dividing evenly between bowls. What are points if I leave off the polenta? this is a great recipe (eating now :)) However I would add snap peas and bean sprouts. Adds no points but gives more volume. My husband is allergic to shrimp…I am thinking of substituting chicken or tofu. Would that change the points much?